For all of you that asked me to try the Prius to heat and cool during my 2016 Travels and report back, I did it! In retrospect, last year (2015 Travels) I didn't think of having the Prius running for heat or cool beyond when I drove the car. I guess the main reason I didn't heat or cool while stationary was because I was looking for the great gas Milage and running the engine to heat or cool would reduce my mpg and I was obsessed with getting the highest mpg I could. What I did this year was heat when I was chilled. Last year I would just get in the sleeping bag and hunker down for the night. When it was too hot I would run the air conditioner to feel comfortable. People that know me know I like heat so I did not run the AC just for my comfort very often. What I did more often was to use the Prius air conditioner to cool the car during the day to keep my Engel Fridge from figing the hot car and draining my house batteries quickly. Just like last year, on my long day hikes I would put the Prius in "Ready Mode" and let my Prius turn on and off to run the Engel fridge and charge my house battery, but this year I also ran the Prius air conditioner when it was hot in the car. This way my fridge ran more efficient. 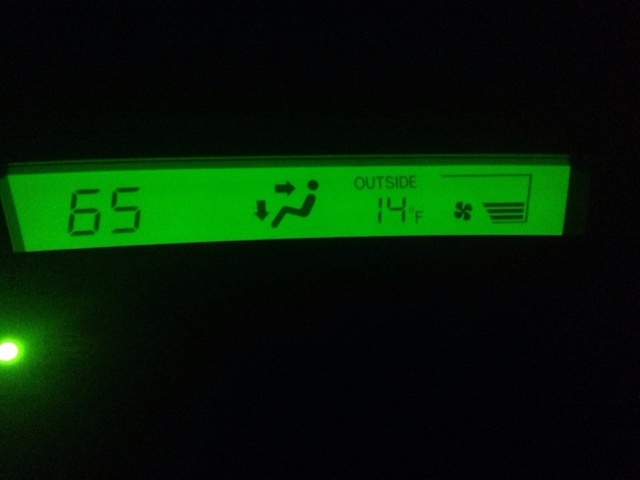 So, I enjoyed the Prius more this year using it for heating and cooling. I say this even though it did contribute to a couple miles per gallon reduction in my overall Milage from doing it. I didn't care. The biggest advantage was to be able to go to the Prius and get ready for bed and fully wash up and wash my hair by having the inside of the Prius nice and warm. Last year I would wash in the Prius during the warmest part of the day. It was much more convenient to wash before bed. The only exception to this was during my few stealth situations. When I stealth I always washed in the afternoon away from my overnight location so when I arrived at where I was staying I was ready for bed. I saved on not driving and paying $12.00 every couple days to get a truck stop shower. Last year I would average a truck stop shower every couple days. This year I would average a truck stop shower once a week. This then results in saving at least two trust stop showers a week at $12.00 each for a total of $24.00 a week. Yes I would use more water but I only pay $.25 for filtered water at a kiosk and use about a quart of water to wash and rinse. In a month I saved the $100.00 that I spent in extra gas in 4 months. I would never have noticed this savings if some of you followers hadent asked about using the Prius to heat and cool this year. It was also great to have air conditioning in the evening for the few times when it was 90 degrees when I wanted to go to sleep and it was just too hot in the Prius. The Prius features that allow for heating and cooling with the car not having to constantly idle is such a great design. I wish Toyota made a small vehicle like the Ford Transit Connect with this same Prius Hybrid System. It would make me think of having such a vehicle with more room to vandwell in it, even if I got less MPG. If my 2017 Travels has me going again in my Prius I would run the heat and air conditioner again to have a more comfortable trip. I know this topic was of interest of a number of people so If you have questions let me know. You sound just like me, I'm also obsessed with getting the best mpg, it drives my wife crazy. It sounds like you have thoroughly tested the heating and air conditioning on the Prius. This will certainly help me, as I have been searching for a new car and the Prius is one of the contenders. Thanks! After my first year (2014) of travels with the class B campervan, it was just too expensive to be driving back and forth across the country getting 10 mpg. As soon as I got home the class B went on the market, and it was in great shape with many repairs, but I needed economy. Everything is a tradeoff. Sure I traded off living space, but I worked most other things in my Prius design. I wanted as many of the features I had with the class B in my Prius. I did it for me as my design may not work for all. I got down to my goal of less than $1000 a month traveling in my Prius and I never worry about the miles I put on.